Slice the cucumber into 5mm thick rounds, place in a sieve and sprinkle with 1/2 teaspoon salt to draw out the water. Wash the rice in a sieve under cold running water until the water runs clear. Cook over a high heat until tender, and remove the rice from the pan. Meanwhile, whisk together the rice vinegar, mirin, sesame oil, soy sauce, caster sugar, lime juice and zest. In a separate bowl, mix together the mayonnaise and wasabi. Spoon the rice onto two plates. 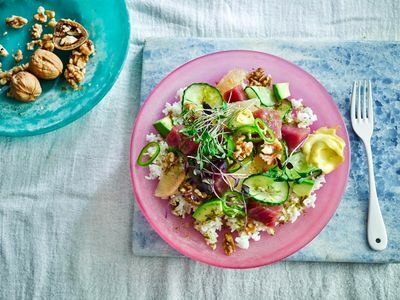 Top with the tuna, cucumber, avocado, toasted California walnuts, green chilli, grapefruit and micro herbs or leaves. Spoon over the lime dressing and add a dollop of mayonnaise to each plate to serve.